Not all African ancestry DNA kits give you the same results! Some give you very little information, and others are an outright waste of money! We dropped $1,000 on 4 different kits to find out which one was the most accurate. Before you start reading, note that we are judging these tests by their ability to use DNA to trace African ancestry. When we use the term ‘African ancestry’, we are not just talking about the company of the same name. I understand that you may not trust what companies are doing with your data. With what we know about Henrietta Lacks and Medical Apartheid, we cant afford to let our DNA fall into the wrong hands. I personally reached out to all 4 of the companies that we reviewed to find out what they do with your DNA once your test is done. I included their responses below, and we took their policies into consideration when we did our reviews. With that being said, here are three reasons you should take an African ancestry DNA test. Be prepared for some reality shattering truths to come out after you get your test results. Some people have found out that their father actually wasn’t. Others have lived their whole lives claiming a heritage that wasn’t theirs. Whether you want to accept the truth or not (and you want this test because you want the truth, right?) DNA doesn’t lie. My family always told me that we are 100% Haitian. We all know that people lie for different reasons. DNA tests will give you the truth once and for all. Remember the article I wrote on the differences between your race, ethnic group, and your nationality? Your race is biological. It is a combination of your genotypes – your genetic makeup – and phenotypes – your eye color, melanin, lung capacity, and other physical traits. When we are talking about race (and gender for that matter), we are not talking about social constructs. We are talking about the physical aspects of who you are. Your ethnicity is based on the group that you share your language, culture, and – to some extent – your ancestry. Nationality is the nation that you are a citizen of. Nothing more, nothing less. So if you are an American citizen, that makes you 100% American. What I want you to remember is that you can be 100% American (nationality), 100% Igbo (ethnicity), and 78% African (race). A good DNA test will definitely be able to tell you your race, but wont be able to tell you your nationality. Why? Because nations change over time. Before 1960, the nation of Mali was known as French West Africa. Before that, it was Songhai. And before that it was Mali again. And before that it was Ghana. Changing political situations can make it difficult to keep track of your lineage. Sticking with DNA is much easier, and far more reliable. One of the biggest reasons members reach out to me is that they are looking for the truth about who they are. I hate to break it to you, but I can’t give you that truth! Yes, I can run down 300,000 years of Black history. I can help you overstand the elements of your life. I can even walk you through a spiritual divination. But at the end of the day, I can’t decipher your bloodlines! So it is up to you to take responsibility (and invest) in gaining the ultimate knowledge of who you are and how you came to be. Once you have that information, you can zoom in on one part of Black history – the part that matters the most to your bloodlines. Taking the test is pretty straightforward: You either spit in a tube or swab your cheeks. The good news is that there is no blood involved! When you understand the difference between these three tests, you can make a better decision about which one is right for you. Translation: When it comes to African ancestry DNA testing, Y-DNA tests only trace your father’s lineage. Furthermore, since this test uses the Y-chromosome, only males can reliably take the test. The point is, not only do Y-DNA tests give you only half the picture, they only work for half to population. Translation: mtDNA Tests trace your lineage from your Mother’s side of the family. mtDNA Tests were the standard for a long time, since they could be taken by both men and women. But you still end up with the same problem as Y-DNA tests – you only get half the picture (your Mother’s side). Translation: Autosomal DNA Tests don’t look at just the X or Y chromosomes. They look at all of your genetic material to get a comprehensive picture of your genetic makeup. Since these tests look at more of your genetic material, they are superior to other tests that only look at your Mother’s or Father’s lineage. Now that you know why you get your test done, don’t just run out and grab the first box with the words African ancestry on the cover! There are several factors that make some tests better than others. Look, these tests are pretty expensive. You want to be sure you are getting your hard-earned dollars worth without spending all day doing research (that’s my job). 1. You want kits that provide information on your autosomal DNA. These tests produce the most comprehensive snapshot of your ethnicity and all your living relatives. These are the criteria that we used to find out which African ancestry DNA Kit was the best. 2. You want to use kits that give you information about both your racial makeup and the ethnic groups you likely come from. It can be almost impossible for a DNA test to tell you your exact ethnicity, but it can offer clues. And in cases where the same ethnic group has been in the same region for an extended period of time (like the Igbo), it can be easier to get that information. 3. You might want to consider kits with a family tree option. Some companies out there let members save their DNA profile and add it to a database of all the other users. That information can then be shared by you with everyone else in that database. So that you can find relatives you might not know about! African ancestry DNA kits that have a family tree feature will automatically fill in parts of your family tree with other users who share your DNA. If you are concerned about privacy, most kits let you opt out of public data sharing. Having a family tree option helps you stay organized as you put together your story, so it’s worth considering. Here are the 4 companies that we reviewed, what they do with your data, and whether they are worth the cost. Does Ancestry Sell Or Use Your DNA? Oh, they do much more than that. Technically, Ancestry.com will own your DNA even after you’re dead. Yo, read that last bullet point again. You can spit in their tubes if you want to go out like Henrietta Lacks. I don’t suggest it. MyHeritage gives you a breakdown of your ethnic percentages and connect you with relatives descended from any of your ancestral lines within approximately the last 6 generations. Both men and women can take the MyHeritage DNA test and the results are not limited to just the direct maternal or paternal lines. Does MyHeritage Sell Or Use Your DNA? While they do store your data for an extended period of time, you have the ability to delete any information whenever you want to. One of the things I liked about MyHeritage was they cover 42 ethnic regions and they have the largest database of global users to be matched with. That increases the odds of being able to find out exactly where you come from. 23andMe uses every type of testing to determine where you come from. However, they only cover about 31 different ethnic groups. Does 23andMe Sell Or Use Your DNA? Just like Ancestry.com, 23andMe will sell the hell out of your DNA. In fact, the company has a $300 million deal with drug giant GlaxoSmithKline. That company will use your DNA for drug testing and will collect data on you for clinical trials. And if they discover a new billion dollar cure using your DNA (like they did with Henrietta Lacks) you are not entitled to a single penny. And according to CNBC, this company can turn your information over to law enforcement, or whoever asks as long as the reason is good enough, apparently. 23andMe did not reply to our request for information about how they use customer data. Can’t trust it. Easy-to-use at-home kit, no membership required. Personalized ancestry reports based on your DNA ready in about 6-8 weeks. Now with 1,000+ geographic regions - the most comprehensive genetic ancestry breakdown on the market. Does African Ancestry Sell Or Use Your DNA? You would thing African Ancestry DNA kits would be our immediate first choice. First off, it costs three times as much as other kits. You would think that means the kit is three times as good, right? And when you read online reviews, people are not happy with African Ancestry DNA kits. That’s a real review from a real customer. To make matters worse, the African ancestry DNA database much smaller than other companies, meaning you get less reliable and less detailed results. Look, I love the fact that this is a Black owned company, but I expect our companies to be just as good as the alternatives out there if they expect to stay competitive. The kits are only available on the company’s website located here. So it turns out that the best African ancestry DNA test is not African Ancestry. Nobody wants to pay three times as much to get half as much information that might not even be reliable. And both Ancestry.com and 23andMe use your DNA for law enforcement, experimentation, and exploitation. Ancestry.com even keeps and owns your DNA long after you die – just like they did still do with Henrietta Lacks. 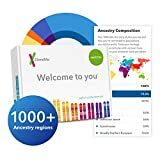 They have the lowest price, the most comprehensive DNA autosomal DNA testing, and the most ethnic groups in their database. They also have some of the highest reviews of all DNA testing kits out there. If you are ready to find out who you really are, where you came from, and fill in your family tree, go with MyHeritage. Are you planning on taking your DNA test? Or have you already done one? Leave a comment below to let us know if this article helped and share your results! A question; my undergrad is in Anthropology / Zoology. I recall lectures about Native American tribes that were “lost” within the Black populations. There were policies that classified Native Americans as “Colored” also. Today, however, the discussions usually claim that there was very little “mixing” between Black slaves and free with Native Americans?? Even though the “civilized“ tribes who walked across America during the “Trail of Tears” were 40% Black. Any thoughts on why the DNA tests fail to show our “Native American” heritage ?? I used My Heritage and the only issue I had was not knowing which DNA was matrilineal or patrilineal. They use both and thats another reason they won the best test. It analyses the DNA inherited from your mother and father, four grandparents, and eight great-grandparents to give you a more complete picture of where you came from. I am reviewing it now. If anything changes, I will DEFINITELY alert you and the rest of the family. Shanta your result is so weird because Nigeria and the Coastal West Africa are Sub Saharan Africa. comprehensive resource of African lineages…” with “over 30,000 maternal and paternal lineages from more than 30 countries and several hundred ethnic groups.” MyHeritage has a much larger GLOBAL database but it sounds like African Ancestry has the most in depth for people of African descent. I vouched for AfricanAncestry.com amd I would probably still would. Even though I know my heritage and lineage to a certain of where Im from(Nigeria-Yoruba), I want to try myHeritageDNA to see the outcome and see what I get from it and may hopefully find other relatives from it. Thanks for this Kaka Malik. When you try it, come back and update us. I did a comparison and I wasnt impressed with African Ancestry mainly because of the price. And I got some pretty vague results (West African – Niger Congo). I gotchu,I”l let you know when I get it done. I got my results….91.1% Nigerian, 7.8% West African & 1.1% Sierra Leonean.